Make the most of your limited time in San Francisco. Enjoy the serenity and beauty of Muir Woods National Monument, see the iconic Golden Gate Bridge, and explore the artsy bayside town of Sausalito, all in about 5 hours! Round out your Bay Area experience with an optional ferry back across the bay. Make the most of your limited time in San Francisco with a 5-hour tour of the North Bay’s Best! Spend an hour and a half in the cathedral-like serenity of Muir Woods National Monument, and then enjoy a tour of the bayside town of Sausalito with 45 minutes of free time to explore on foot. You can choose to head back to the city on our mini-coach, or opt for a ferry ride across the bay with views of the San Francisco skyline, the Golden Gate Bridge, and Alcatraz Island! 7:15am/8:00am/8:30am/9:00am/1:30pm/2:00pm/2:45pm (depending on date and tour choice): Pick up from Hilton Union Square hotel. Drive across the Golden Gate Bridge, and stop at a viewpoint for that perfect photo (weather permitting). 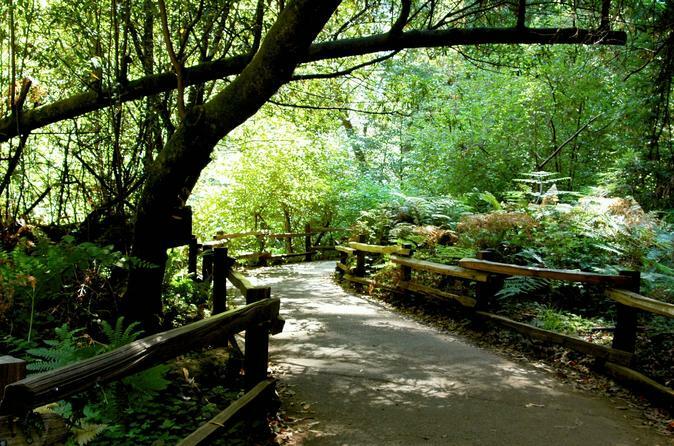 Arrive at Muir Woods National Monument, where you will have 90 minutes to walk the trails and check out the cafe and gift shop. Back in the vehicle, you’ll wind your way down into Sausalito. You’ll have 45 minutes to explore, or you may choose to take a ferry back across the bay and stay longer up north. approx 4-5 hours later: Hop back on the mini-coach, if you’re taking the mini-coach back across the bridge. You’ll be dropped back off at the Hilton.